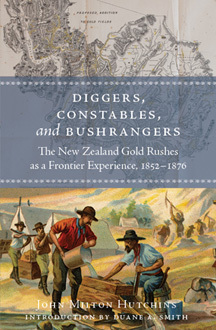 Hutchins’ book has the added value of clearly placing New Zealand as a small but significant link in the international sequence of nineteenth century gold rushes. See also this post by Jonna about this book from a couple of years ago. This entry was posted in books and tagged Diggers Constables and Bushrangers: The New Zealand Gold Rushes as a frontier Experience 1852-1876, John Milton Hutchins. Bookmark the permalink.